Caitlin Ward is one of a number of rising stars of Australian sprinting. 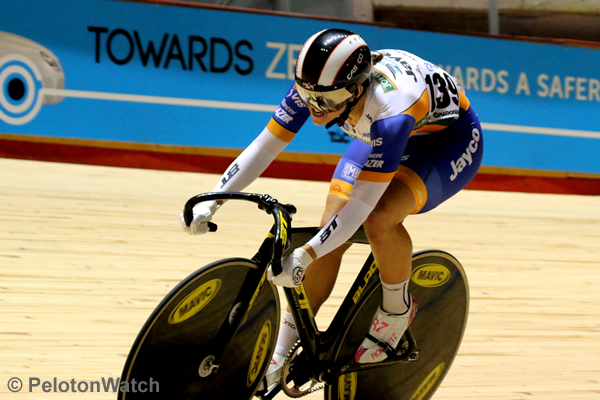 Silver medallist in the sprint at the Junior Track World Championships in 2012 as the reigning Australian Champion. 2014 has seen Ward take a step forward in her development. Trips to Japan and New Zealand with Australian teams have seen Ward claim four international UCI sprint victories. Four medals from four events at the National Championships saw Ward named in the long team for the Commonwealth Games. It has not all been smooth sailing though with an admittedly disappointing performance at the Austral carnival in December. Despite the up and down year Ward was named in the Australian team for her first World Cup in Cali this weekend. Ranked 17th in the world, Ward is looking to gain experience from the three days of competition. Below Ward talks her 2014 season, the Austral Carnival and being selected for her first World Cup. PelotonWatch: 2014 was a big year for you. Four medals at National Championships, named in Commonwealth Games long team and sprint wins in Japan and New Zealand how would you describe your year? Caitlin Ward: It was a massive learning curve - there was some results that came of it that are good stepping stones to bigger things but there also were lots of things that I had to over come and learn to deal with, lots of things that didn't go according to plan and experiences that I didn't necessarily enjoy but have been good in shaping me into a tougher unit. Sometimes for athletes we get so caught up in the future and working towards goals that we forget to stop and appreciate what we have achieved, so now I think about it I am pretty proud that through the highs and lows that I have pulled out some quick times, good racing and good results. PW: Did you approach things differently in regards to training, lifestyle or studying? CW: I have always believed that balance is really important for athletes so even though I travelled a bit this year I kept up study and was really lucky with the support the Australian Catholic University gave me with flexible classes/extra help that allowed me to juggle everything. My coach Hilton Clarke and my gym coach Ben Willey worked together along with the support staff at VIS to accommodate different issues that arouse throughout the year and I am lucky enough to have such a wonderful team ensuring I have opportunities and in the best physical state I could be. PW: Your last competition was the Austral carnival where you claimed third in the sprint. Happy with your performances? CW: The Austral is an event that I hold close to my heart and I am so happy it is back at Hisense, it had a sell out crowd and that everyone seemed to enjoy the racing and the atmosphere. I wasn't focusing on the event and its always hard going into a race that you really want to ride well in but train right through it, so although my time was average, I thought I raced the sprints smart - just didn't have the legs. PW: You won the 7-12 keirin final. Were you disappointed not to qualify for the 1-6 final? CW: I just made a mistake and left the run to late in the rounds so yes this was disappointing, it's always frustrating in hindsight going through the 'shoulda, woulda, coulda's' but it makes you stronger and teaches you not to make these mistakes again. PW: How did you feel when you were first told you had been selected for the Track World Cup in Cali? CW: It's a really wonderful opportunity that Cycling Australia have given me, I am really proud to pull on the green and gold for the first time since Junior Worlds and represent my country again. It was also great for it to get announced on Christmas eve as it gave me the opportunity to see my families reaction which I generally miss out on because we are scattered across Victoria and it was lovely to see how genuinely excited and proud they all were of me and let them share a bit of the experience. I Also get to go away with a great team and I think we will lift each other up and cheer one and other on to ride our absolute best; hopefully its full of PB's for everyone. PW: It is your first World Cup what are you hoping to take away from it? CW: The whole experience is new for me, and in many ways it's great to be going away with such a young team because we are all going through the same thing together. I feel really privileged to go away with the Aussie team again because I have learnt so much in the past. So I am just wanting to learn as much as I can, concentrate on the process of competition and all that it involves, execute some good races and hopefully good form and great times come along with that. PW: What are your major goals for 2015? CW: Hopefully some quality time with the High Performance Unit in Adelaide, some good racing but predominately training hard towards a stronger, faster, fitter and smarter Katie - what that leads to I cant tell you but we are planning on a speedy 2015 - I guess I'll let you know this time next year! Caitlin Ward during sprint qualifying at the Austral Carnival.